Interrobang Wayzgoose* is a regional festival of Book Arts. Printers and book enthusiasts gather to hear talks about the artistry and industry in book arts. The public is welcome to attend presentations and demonstrations, shop in the marketplace, tour Book Arts Collaborative and Tribune Showprint Posters, and meet with visiting book arts enthusiasts. We host a marketplace where people sell their work, printers’ and binders’ tools, art materials, etc. 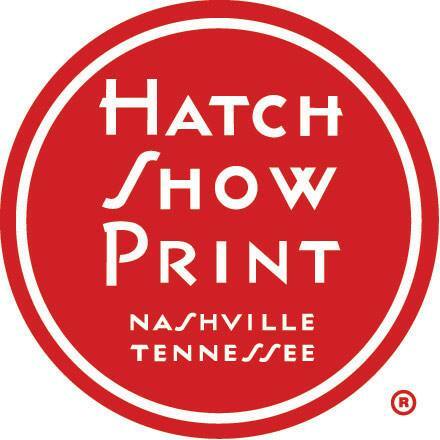 Representatives of Hatch Show Print in Nashville, TN; Firecracker Press in St. Louis, MO. ; Younder Bound in Indianapolis, IN; Moore Wood Type in Columbus, OH; and Muncie’s own Tracy Jarrett, paper decorator, have exhibited in our marketplace. Interrobang is a 1.5 day event, starting on Friday evening and running throughout the day on Saturday. *An interrobang was invented by designer Martin K. Speckter in 1962. It combines a question mark with an exclamation mark, and Speckter meant it to express extreme bewilderment. At Interrobang Wayzgoose, we prefer to think it means extreme curiosity. *A wayzgoose (or wayz-goose, waygoose or wayzegoose) was at one time an entertainment given by a master printer to his workmen each year on or about St Bartholomew's Day (24 August). It marked the traditional end of summer and the start of the season of working by candlelight. We celebrate Wayzgoose at Book Arts Collaborative on the eve of summer, when our students will disperse for the season. Vendors from across the midwest will offer tools, materials, supplies, vintage equipment, artist books, and print ephemera for purchase. AlphaBlox Printing - Free workshop all day for families. A Hunt and Rescue Mission: Marrying Two 19th Century Oval Portraits With Frames From The Period. Food trucks and The Guardian Brewing Company will offer food and drink for sale. Once again, we have partnered with the Muncie Downtown Courtyard Marriott to offer rooms to visitors. The group rate is $109 for the night of April 11th & April 12th. The hotel is centrally located in Muncie and within lovely walking distance to the Madjax building, where Book Arts Collaborative and Tribune Showprint Posters are located, and where Interrobang is held. Use the link below to book at our special rate. 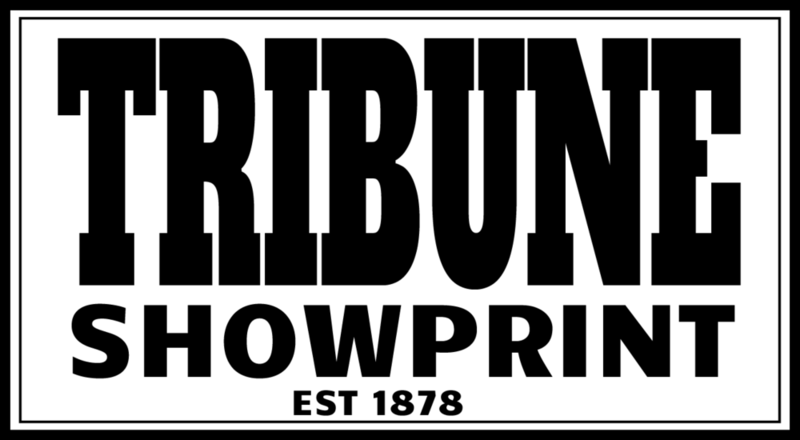 Book Arts Collaborative and Tribune Showprint Posters, Inc. are delighted to welcome friends from the regional letterpress and book arts community. Please join us on Friday evening and Saturday to meet, listen to, and learn from the following contemporary practitioners of book arts. Sarah M. Allison is the Special Collections Librarian at Ball State University where she oversees the Special Collections Unit. Sarah received her MLIS from Valdosta State University and her BA in Art History from the University of Redlands. 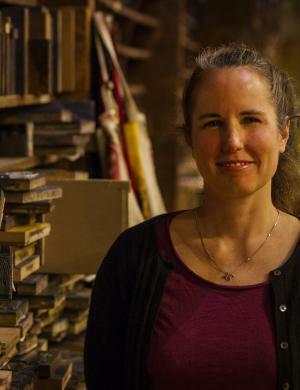 During her 10 plus years working in Special Collections, Sarah is committed to providing access, preservation and promotion of primary and rare material. She also is very interested in researching the value and contribution of undergraduate student employees in our profession. Aubry is the associate director at Hatch Show Print, the legendary print shop that got its start in 1879 in Nashville, TN. Celene is returning to Interrobang to talk about the gradual admission of women into letterpress shops. Hatch Show Print began with a handbill for Rev. Henry Ward Beecher (the brother of Harriet Beecher Stowe), and became a prominent printer for the entertainment community of Nashville. It now functions as a press, a gallery, and a learning environment, where Celene is the shop manager and a master printer. The National Library Bindery was originally established in 1873 by German immigrant Christopher A. Schnabel to convey the written word to the early settlers and pioneers of the Midwest. 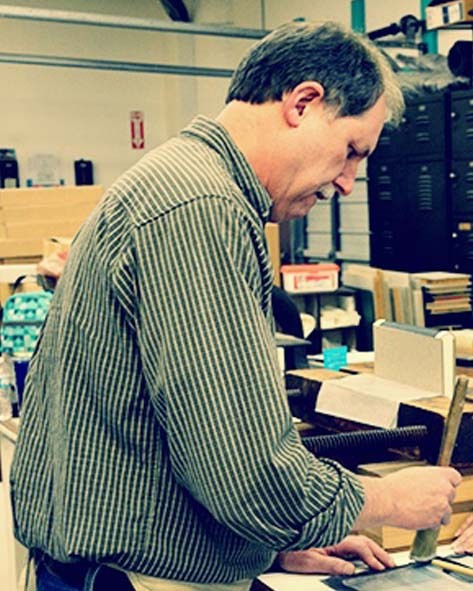 The bindery now faithfully preserves those traditional bookmaking techniques developed during the turn of the century. Our team of binders specialize in producing high-end, deluxe edition books, archival quality preservation of publications, and restoration of antiquated books. The last Schnabel family member retired and sold the company to Joseph Cox, the current owner. Kelcey Parker Ervick is the author of Defunct, this year’s publication from Book Arts Collaborative Press. Her other works include The Bitter Life of Božena Němcová and Liliane's Balcony, which won silver awards for the Independent Publishers, Foreword, and Eric Hoffer Book Awards. Her story collection, For Sale By Owner, won the 2011 Next Generation Indie Book Award in Short Fiction and was a finalist for the 2012 Best Books of Indiana in Fiction. She is co-editor, with Tom Hart, of the forthcoming Field Guide to Graphic Literature, which Rose Metal Press will publish in 2021. She has a Ph.D. from the University of Cincinnati and teaches creative writing, comics, and collage at Indiana University South Bend. Marie is a maker, collector, and teacher holding a BFA from the University of Kansas in Textile Design and an MFA from Cranbrook Academy of Art in Fiber. Her understanding of pattern, printing, and weaving combined with her passion for artifacts led her to the art of letterpress printmaking. 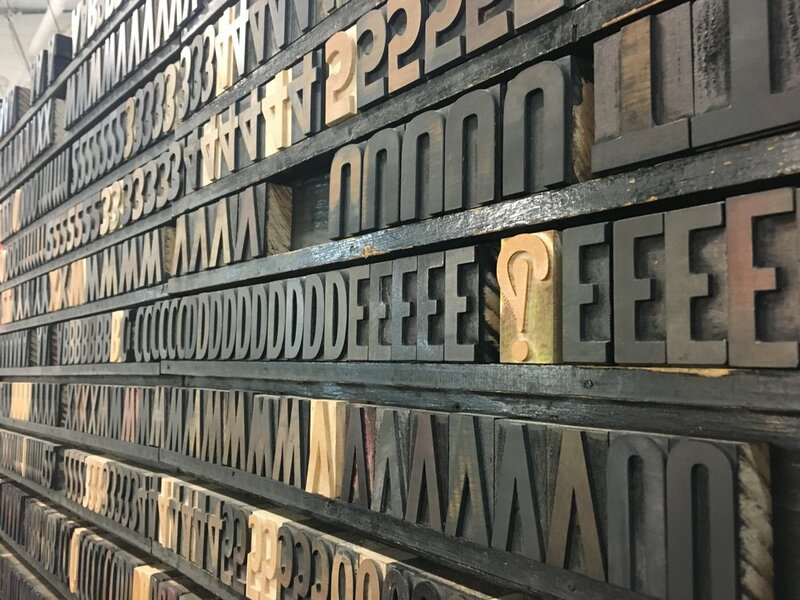 With an extensive background in non-profit arts and event management, Marie is committed to preserving and promoting letterpress printmaking through education, public programs, and restoration. Central Print is located in St. Louis' Old North neighborhood. Carl is a trained art historian whose 25+ year career in the museum profession has focused on designing exhibitions and caring for works of art in virtually all materials representing the world’s major civilizations across time. That experience informs his work as a craftsman when restoring antique picture frames and designing replica frames. His expertise includes water gilding, oil gilding, hand-carving, and custom toning, as well as rebuilding of damaged ornaments and gilded surfaces. Carl works with several museum clients and with individual clients to preserve cultural and family treasures. He has also worked as a community leader as the founding president of the Muncie Arts and Culture Council, promoting the activities of arts organizations in Muncie. Michael Szajewski currently serves as the Assistant Dean for Digital Scholarship and Special Collections at Ball State University Libraries. He holds a BA in Communication Studies and History from Northwestern University and a Master of Library Science degree from Indiana University; he has worked as a librarian at Ball State University since 2011. His professional and scholarly interests include archival collection building, digital scholarship and publishing, and community programming for libraries and archives.